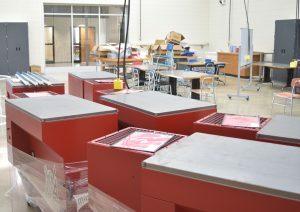 The new career center includes a lounge area, still awaiting lights and furniture. The brick wall at left was originally the outside wall on the south side of the school. The $4 million Orrin S. Estebo Career Development and Training Center officially opened this week as part of the Redwood Area School District. Business and ag classes started up in the new facility as second semester classes started. If you tour the facility now, you’ll see students in some areas taking classes, and workers still putting finishing touches on the structure. Much equipment is on back order, from 3D printers and computers to a new garage door. 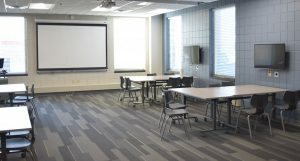 The center is designed for maximum flexibility, with most equipment and furniture on wheels and able to be configured as needed for that day. 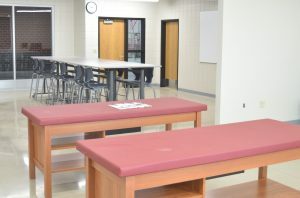 The new ag shop, opened for classes on Monday, has spaces that will allow animals to be brought into the classroom. 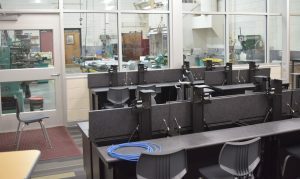 A new business lab has five computer workstations that can be linked or used separately as needed for different purposes. 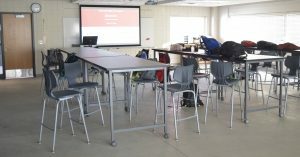 A new engineering class is still waiting for computers and 3D printers to be installed. The old metal shop can be reached through the door at the left. The official dedication for the site hasn’t been scheduled yet, but to see some photos of the new center up and running this week, check out our website at myklgr.com. The new health lab will be set up like a clinic, allowing students of all ages to learn health care skills. The “Lead the Way” room can be used for a variety of mechanics-related classes, from car repair to welding. 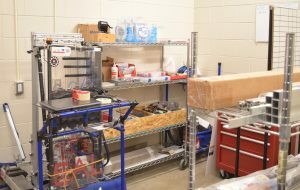 Here’s something you wouldn’t have seen in a school 20 years ago: the robotics storeroom as seen Monday as new equipment was being brought in. 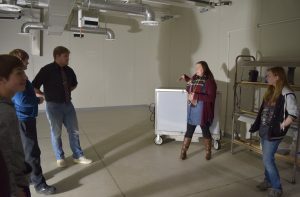 Ag teacher Lisa Orren showed students through the new grow room in the career center Monday afternoon. 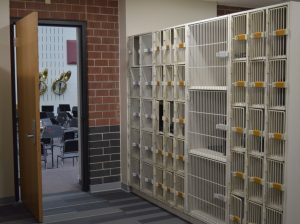 Existing departments have been modified in the addition as well, such as a new music instrument storage area capable of holding more than 300 instruments.